The effect of insect herbivory on the growth and fitness of introduced Verbascum thapsus L.
(C) 2013 Hannah D. Wilbur. This is an open access article distributed under the terms of the Creative Commons Attribution License 3.0 (CC-BY), which permits unrestricted use, distribution, and reproduction in any medium, provided the original author and source are credited. A majority of the plant species that are introduced into new ranges either do not become established, or become naturalized yet do not attain high densities and are thus considered ecologically and economically unproblematic. The factors that limit these relatively “benign” species are not well studied. The biotic resistance hypothesis predicts that herbivores, pathogens and competition reduce growth and reproduction of individual plants and so suppress population growth of non-native species. We explored the effect of insect herbivory and surrounding vegetation on growth and fitness of the non-native biennial plant Verbascum thapsus (common mullein) in Colorado, USA. Mullein is widespread in its introduced North American range, yet is infrequently considered a management concern because populations are often ephemeral and restricted to disturbed sites. To evaluate the impact of insect herbivores on mullein performance, we reduced herbivory using an insecticide treatment and compared sprayed plants to those exposed to ambient levels of herbivory. Reducing herbivory increased survival from rosette to reproduction by 7%, from 70–77%. Of plants that survived, reducing herbivory increased plant area in the first year and plant height, the length of the reproductive spike, and seed set during the second year. Reducing herbivory also had a marked effect on plant fitness, increasing seed set by 50%, from about 48, 000 seeds per plant under ambient herbivory to about 98, 000 per plant under reduced herbivory. Our findings also highlight that the relationship between herbivory and performance is complex. Among plants exposed to ambient herbivory, we observed a positive relationship between damage and performance, suggesting that, as predicted by the plant vigor hypothesis, insect herbivores choose the largest plants for feeding when their choice is not restricted by insecticide treatment. 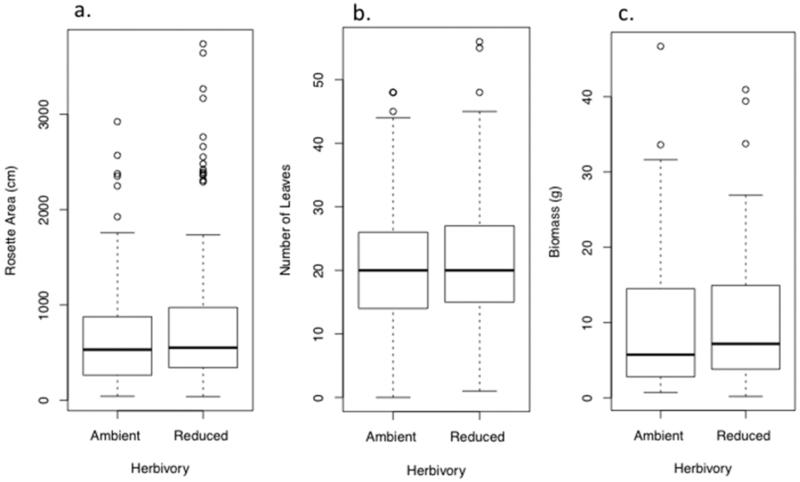 In contrast to the strong effects of experimentally reduced herbivory, we found that cover of other plants surrounding our focal plants explained relatively little variation in performance outcomes. Overall, we found that herbivore-induced impacts on individual plant performance and seed set are substantial, and thus may help prevent this naturalized species from becoming dominant in undisturbed recipient communities. There are over 29 published hypotheses addressing the success of introduced species in their new range (Catford et al. 2009). Support for the different mechanisms is mixed, with experimental investigations offering conflicting results (Colautti et al. 2004, Catford et al. 2009). One potential reason for this discord is that research has largely focused on species that are either dominant members of the community in their novel range or that incur obvious and extensive environmental and economic costs (Hawkes 2007). However, the vast majority of introduced species are not dominant (Williamson and Fitter 1996), and many are considered benign (Lockwood et al. 2007, Dietz and Edwards 2006) or even beneficial (Schlaepfer et al. 2011) in their new range. The bias in research toward species that cause obvious damage may obscure patterns that would be apparent if more data were available from the entire continuum of non-native species, spanning the spectrum from beneficial to detrimental. To better understand the mechanisms that enable some introduced species to dominate their new communities we must determine which mechanisms prevent other introduced species from doing so (Mack et al. 2000). In the native ranges of plants, herbivores and pathogens can strongly reduce plant performance (Bigger and Marvier 1998; Carson and Root 1999, Maron and Crone 2006; Morris et al. 2007), and in cases this can be paralleled in the introduced range when native generalist herbivores (Parker et al. 2006) or introduced specialist herbivores (e.g. Suckling 2013) suppress plant performance (a component of biotic resistance; Maron and Vila 2001, Levine et al. 2004, Alpert 2006, Catford et al. 2009, Davidson 1993, Olff and Ritchie 1998, Parker et al. 2006). Insect herbivores in general reduce plant performance more than vertebrate herbivores (Bigger and Marvier 1998), and also are used in the biological control of introduced plants. As such, investigating the degree to which insect herbivores mediate the performance of non-native plants may provide a unique perspective for understanding the spectrum of invasiveness among introduced species. Recent work illustrates the dual roles of herbivory in shaping the outcome of invasions. In a meta-analysis, Hawkes (2007) compared herbivore damage in the native and introduced ranges of plants and found that the degree of invasiveness in the new range was directly correlated to damage from herbivory. Plants classified as noxious weeds (i.e. 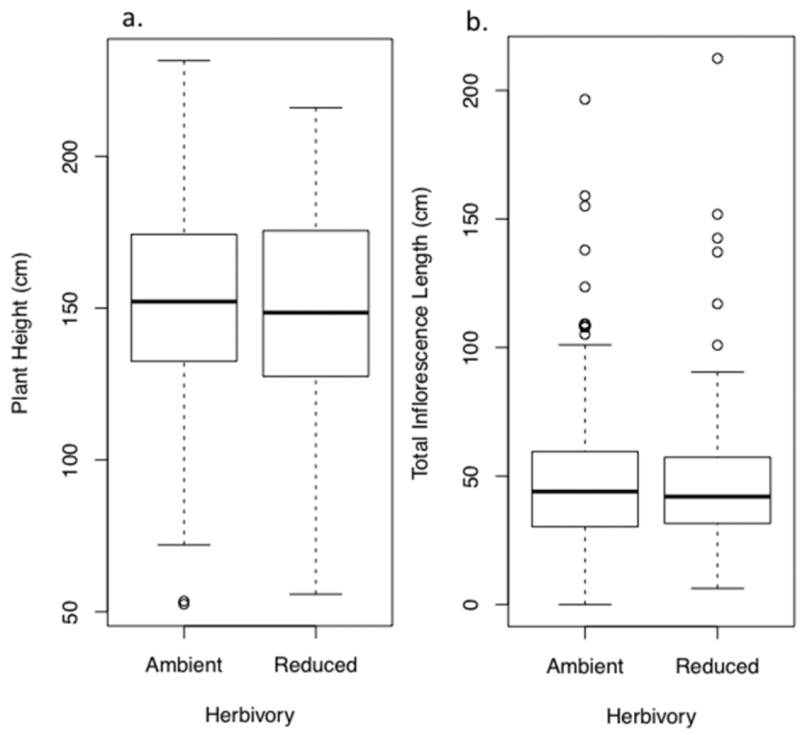 on the strongly invasive side of the spectrum) had lower levels of herbivory in the new range, while less weedy plants had similar levels of herbivory in the new and introduced ranges. Introduced populations that escape from herbivores may exhibit increased performance relative to their native counterparts, and yet still be suppressed to some degree by herbivores accumulated in the new range (Colautti et al. 2004). Parker et al. (2006), in another meta-analysis, found that generalist herbivores, with a focus on vertebrates, can suppress introduced plants. Despite the fact that insect herbivores can have stronger effects than vertebrates (Bigger and Marvier 1998), relatively few studies have experimentally tested the potential of insect herbivores to impose biotic resistance on introduced plants (Colautti et al. 2004). Our broad goal here is to gain insight into the processes affecting introduced species that do not regularly dominate their recipient communities. Specifically, we explored the effects of insect herbivory on the performance and fitness of Verbascum thapsus (common mullein), by reducing insect herbivory using insecticides. Common mullein is an herbaceous biennial that has been present for several centuries in the North America following its introduction from Europe. It is ideal for exploring biotic resistance mediated by insect herbivores: previous research documents shifts in its ecology in the introduced North American range (Alba and Hufbauer 2012), and while it has exhibited marked expansion during it long residency in its North American introduced range, it is not often considered a species of great concern. Mullein is a monocarpic forb with an annual to triennial life cycle (Reinartz 1984), though it is a biennial through most of its range. It is broadly distributed in North America, occurring in all US states and most Canadian provinces (Gross and Werner 1978). However, it is often restricted to disturbed habitats and thus seldom considered a priority for limited management resources. It germinates in the early spring and forms a wooly-leaved rosette in the first year of growth. After overwintering in the rosette stage, plants send up a flowering spike that can reach up to 2 m in height (Baskin and Baskin 1981, Gross and Werner 1978). While the typical growth form is a single spike, particularly large plants and those that incur apical meristem damage may produce several axillary inflorescences (Lortie and Aarssen 2000). Mullein reproduces purely by seed. Seeds are small (50 to 100 µm in diameter) and plants are quite prolific; a single plant may produce more than 100, 000 seeds in its lifetime (Gross and Werner 1978). Seeds can remain dormant in the soil for long periods before germination (Kivilaan and Bandurski 1981). Plants flower from June to September in the western United States, with a few flowers along the stalk opening every day. The flowers last for one day and will self-pollinate when closing if pollination by insects has not already taken place (Gross and Werner 1978). Mullein populations in the mountain west of the U.S. are more dense and larger, and individual plants are also larger, than are those in the native European range (Alba and Hufbauer 2012). These changes in performance are at least partially evolutionarily based (Alba et al. 2011, Kumschick et al. 2013) and are associated with escape from several specialist herbivores as well as reduced leaf herbivory relative to native mullein (Alba and Hufbauer 2012; Alba et al. 2012). These patterns suggest that introduced populations have in part escaped natural enemies and may experience weakened top-down regulation. Reductions in pathogen abundance may well contribute to enemy escape (Alba, Hufbauer, Norton, personal observations). For example, mullein plants grown in a common garden environment in their native range (Czech Republic) experienced high seedling mortality and persistent infection over the lifetime of most plants from an as yet unidentified leaf spot fungus. In contrast, plants growing in a parallel experiment in the introduced range (Colorado) showed no signs of infection (Alba and Endriss, personal observations). Despite evidence for enemy release at the biogeographic scale, substantial herbivory by generalists as well as co-introduced specialists can occur in introduced populations (Alba and Hufbauer 2012). Indeed, at sites in Colorado, mullein plants can lose up to 25% of their leaf tissue to generalist grasshoppers and caterpillars that have incorporated the weed in their host range (Alba, personal observation). Additionally, two co-introduced herbivorous insect species are found in North America. Gymnetron tetrum Fabricius (synonym Rhinusa tetra), a specialist weevil, is found throughout the introduced range of mullein. The larvae develop in the maturing seed capsules and consume a majority of seeds within before emerging (Salisbury 1942, Reinartz 1984). A second specialist (Haplothrips verbasci [Osborn]) is more common in the introduced range than in the native range (Alba and Hufbauer 2012). Thus, even though escape from enemies may contribute to larger populations and individuals in the introduced range relative to the native range, herbivory still has the potential to reduce performance in the introduced range. To evaluate the effects of herbivory on performance of common mullein, we experimentally reduced herbivory on plants in the field using insecticides. We imposed two main treatments: reduced herbivory (insecticide) and ambient herbivory (water). Additionally, we added a set of no-water control plants part way through the experiment. We evaluated whether reduced herbivore damage increased survival to reproduction, performance during the first growing season (rosette area, leaf number, and biomass), performance in the second growing season (plant height, inflorescence length) and performance when protected from herbivory during both growing seasons (plant height, inflorescence length and seed production). The experiment took place at a site in Loveland, CO (40°22'29"N, 105°13'32"W, elevation 1650 m) with a history of substantial disturbance, including being used as a staging area for a large construction project and for grazing. The site is currently owned by Larimer County and is maintained as open space. This site was chosen along with two additional sites (which were lost during severe hail storms in the early stages of the study) for three main reasons: the sites had vegetation representative of other areas in the foothills where common mullein is present, land managers were willing to stop controlling common mullein and other weeds for the duration of the study (i.e. no herbicides, mowing or cutting would take place), and finally, we were able to get permission to spray insecticides as the sites received relatively little foot traffic. Plants along 12 transects were marked with a raised nail and metal tag, and assigned randomly to one of the two main treatments: reduced herbivory (insecticide) or ambient herbivory (water). We started with 551 plants in April 2009. This comprised both overwintered rosettes, which we followed until they bolted (n = 126) and first-year rosettes (n = 425), a subset of which we harvested after the first summer (n = 70), and the rest of which were followed through their entire lifecycle (n = 355). In spring 2010, we started tracking an additional 42 plants along the same transects, which received neither insecticide nor water. Table 1 summarizes sample sizes for the first-year rosettes that were then followed for two seasons. Sample sizes, mortality, and proportion mortality for the plants (first year rosettes) followed for two growing seasons. Formulas reference the first column of letters to indicate how calculations were done. 1 Harvest of 70 of the first-year rosettes, fall 2009, to measure biomass. 2 Number of plants for which data on number of leaves and rosette area were recorded in year 1. These included plants on which biomass was measured. Some plants were missed, and thus, this column plus summer mortality does not sum to exactly the same number as at the start. Plants were sprayed with either an insecticide solution or water every two weeks during the growing season using a 5-gallon (18.9-liter) Solo backpack sprayer. We investigated whether the water added in the ambient herbivory treatment increased plant performance by comparing those plants to the additional 42 plants that received no treatment. The first insecticide application was a mixture of esfenvalerate, (33112 Insecticide Concentrate, Bengal Products, Inc. 3.48% active ingredient esfenvalerate) which has been shown to have no or little effect on plant growth (Root 1996) and spinosad, (Lawn and Garden Spray with Spinosad, Green Light Company, 0.5% active ingredient spinosad). Spinosad is particularly effective against Thysanoptera, and thus was chosen to target the specialist thrips Haplothrips verbasci. We used a recommended rate of 0.0015% esfenvalerate and 0.0076% spinosad in water. We used Bayer Advanced Dual Action Rose & Flower Insect Killer Concentrate with active ingredients imidocloprid (0.72%) and beta-cyfluthrin (0.72%) for all subsequent herbivory reduction treatments. We switched because we anticipated getting more effective control with this systemic insecticide. We first tested whether it affected mullein growth, and observed no effects (Appendix), a finding supported by Williams et al. (2010). The insecticide was diluted and applied at a rate of 0.0028% of imidocloprid and 0.0028% beta-cyfluthrin in water solution. To evaluate the effectiveness of the insecticide in reducing herbivory and to gather data for inclusion in subsequent analyses, we estimated leaf herbivory experienced by each plant every month during both growing seasons. Herbivory was scored from low to high (0 to 4) following Lewis et al. (2006): 0 = no damage; 1 = minimal damage with no more than about 5% of any leaf damaged; 2 = minimal damage plus some leaves with 5–10% damage; 3 = 10–50% damage on multiple leaves, but fewer than half of all leaves affected; 4 = at least half of all leaves with 10–50% damage, and multiple leaves with more than 50% damage. The specialist seed predator Gymnetron tetrum consumes nearly all seeds in locules it infests within a given fruit capsule (Salisbury 1942), substantially reducing seed set (Reinartz 1984). Our insecticide treatment was focused on leaf herbivory, but we did also spray inflorescences when they developed. Thus, we also evaluated our ability to reduce seed predators at the end of the 2010 season by comparing seed capsule attack rates between treatments (see Plant Performance 2010). We measured weevil attack at 5 locations along each inflorescence (nambient = 60, nreduced = 45), starting 5 cm from the top, and then dividing the rest of the inflorescence into 5 intervals. At each interval, all of the seed capsules within 2 cm were counted and then dissected to determine if weevils were developing inside. Cover of plants surrounding target individuals may negatively affect growth via competition, or alternatively may be associated with higher quality sites and greater plant growth. To take these types of processes into account, we estimated the percent cover of plant functional groups and bare ground directly adjacent to each mullein plant. We used a digital camera (Nikon D90, AF-S Nikkor 18-105 mm 3.5-5.6G ED lens, automatic setting), placed 68 cm above the ground, to photograph cover quadrats during the first week of June in both 2009 and 2010. For small first-year plants, we centered a 30 × 30 cm frame around each plant and estimated cover within the frame, excluding the mullein plant itself. For larger second-year plants, we placed a 15 × 30 cm frame adjacent to the plant, in each of the four cardinal directions. The cover photos were processed using SamplePoint according to the methods described in Booth et al. 2006. At the beginning of the growing season, before treatment, we estimated the area of first- and second-year rosettes (from measurements of diameter in both directions) and estimated levels of herbivore damage on the leaves. For first-year rosettes, at the end of the growing season, we collected information on survival and growth of each plant. For these plants (n = 344 after summer mortality) we measured rosette area, counted the number of leaves, and took a final estimate of herbivore damage for the year. A subset of these plants (n = 70) was harvested to obtain biomass data. We removed plants at their base and oven dried them to constant weight before weighing them to the nearest 0.1 g.
Most second-year plants that started as overwintered rosettes in the spring of 2009 bolted that year, and were harvested as they senesced in mid-September 2009. For each plant we measured plant height, inflorescence length (from the first seed capsule at the base of the reproductive stalk to the top of the stalk), and number of branches. In April of 2010 we identified all first-year plants that had overwintered successfully (n = 266) and resumed treatment regimes. At the end of the growing season we measured plant height, main stem inflorescence length, and total inflorescence length (i.e., including axillary branches). Additionally, on a subset of plants, we measured seed capsule density and the number of seeds per seed capsule as described below. From these measurements, we calculated the total number of seed capsules per plant, and extrapolated to the total seed set per plant. Seed capsule density. We measured the density of seed capsules on all of the 259 plants that survived to produce inflorescences greater than 5cm in length (nambient = 107, nreduced = 110). We used this cut-off, because seed capsules in the top 5 cm of the inflorescence were smaller and denser than the rest of the inflorescence, and often did not contain successfully developed seeds, and thus were not representative of the inflorescence as a whole. On the plants for which we measured seed capsule density, we counted all seed capsules in a 20 cm length of inflorescence, starting 5 cm from the top. When the inflorescence was shorter than 25 cm, the top 5 cm was still not counted, but all the remaining seed capsules were. Number of seed capsules. We calculated the number of seed capsules per plant by multiplying the seed capsule density by the total length of the inflorescence. Number of seeds per seed capsule. To determine the average number of seeds produced per capsule, we collected individual seed capsules from a subset of plants (nambient = 24, nreduced = 22). We removed seed capsules at equal intervals along the inflorescence for a total of 7 seed capsules per plant. Seed capsules were only collected if the capsule was not yet opened and thus had its full complement of seeds. Each seed capsule was placed in its own envelope. We counted out and weighed 50 seeds from each capsule, then weighed all of the seeds in the capsule. The number of seeds per capsule was then estimated by dividing total mass by mass per seed. Sample size was reduced from 7 from each of the plants to one or two, due to weevil infestation. To assess the effectiveness of the insecticide treatment in reducing chewing herbivory, we used the MIXED procedure in SAS 9.2 (SAS, 2012). We evaluated whether herbivory in the first month of the season was comparable across treatments to confirm that there was not an unintentional bias in herbivory at the outset of the experiment. Then we evaluated treatment effectiveness in reducing herbivory by evaluating annual average herbivory. We used the average across months because it had the best explanatory power for the plant performance analyses described below (according to comparisons of AIC, analyses not shown). Treatment was included in these models as a fixed effect and transect as a random effect. We used the GLIMMIX procedure (SAS 9.2) to evaluate whether treatment altered the proportion of seed capsules with weevils, using the events/trials syntax, and a logit link. To evaluate the effects of water addition from insecticide treatments on plant growth, we used a mixed model to compare plants that had received the water-only treatment (ambient herbivory) to the untreated plants. We included treatment as a fixed effect and transect as a random effect. We performed separate ANOVAs for each of the response variables, which included plant height, total inflorescence length, and seed capsules per plant. We used PROC GLIMMIX in SAS 9.2 with a binomial error distribution (alive vs. dead) to test for differences in survival among treatments for the plants treated for both growing seasons. The model included treatment as a fixed effect and transect as a random effect. Covariates (additional fixed effects) included initial plant size, vegetative cover, and average herbivore damage. While the insecticide treatment was effective at reducing insect attack (see results below), it did not prevent it all together, and levels of herbivore damage were variable within each treatment. Thus, it was also important to include the measure of herbivory. To evaluate the effects of herbivory on the performance of mullein that survived, we created mixed models in JMP. For first-year plants (measurements taken at the end of the first growing season), response variables were final rosette area, number of leaves per rosette, and rosette biomass. The model included treatment (ambient vs. reduced herbivory), initial rosette area in 2009, cover of surrounding vegetation, average herbivore damage through the season, and the interaction between herbivore damage and treatment as fixed effects and transect as a random effect. For second-year reproductive plants (measurements taken at the end of the experiment), the response variables analyzed using this model included plant height, inflorescence length, number of seed capsules per plant and number of seeds per capsule. The model was the same as for the first-year plants, except that cover data for both years and average herbivory over both years were included. As plants were located along transects, we also checked for serial correlation in the data (spatial correlation along one dimension). There was no evidence for such autocorrelation, thus number along transect was not included in any models (analyses not shown). For several analyses, the Satterthwaite approximation was used in calculating degrees of freedom, as it does not assume variances are equal across sample groups. This can result in non-integer degrees of freedom. For the above models, we log transformed initial and final area of rosettes, total inflorescence length, and number of seed capsules, to improve the normality of the residuals. All data presented have been back-transformed for ease of interpretation. Damage did not differ between the plants assigned to the two treatments prior to the start of the experiment (meanambient = 1.0, meanreduced = 1.0, F1, 528.3 = 0.03, P = 0.87), indicating no bias in treatment assignments at the outset. Subsequent insecticide application significantly reduced average herbivory in 2009 (meanambient = 1.4, meanreduced = 1.1, F1, 527 = 27.59, P < 0.0001). Patterns of damage were similar in the second year. In the spring of 2010, the first damage estimates did not differ between treatment groups (meanambient = 0.6, meanreduced = 0.7, F1, 255.7 = 0.50, P = 0.48), but rates of herbivory were low at that time. By the second month, levels of leaf herbivory had increased overall, but were significantly lower in the insecticide treated plants relative to the water controls, and this continued to be the case until the experiment was terminated in the fall of 2010 (meanambient = 1.8, meanreduced = 1.0, F1, 259.8 = 1.06.1, P < 0.0001). Insecticide treatment reduced attack by the seed-feeding weevil Gymnetron tetrum (F1, 96, P < 0.0001) from 24% in water controls to 20% in the insecticide treated plants. Plants in the ambient herbivory (water-only) treatment did not differ from untreated (i.e. no water) controls with respect to plant height (F1, 155 = 0.3454, P = 0.56), total inflorescence length (F1, 157 = 0.4545, P = 0.50), or seed capsules per plant (F1, 147 = 0.0053, P = 0.94). Reducing herbivory over both growing seasons significantly increased survival by 7% (from 70% to 77%, F1, 323 = 8.1, P = 0.005). Interestingly, neither initial plant size nor percent cover of surrounding vegetation altered survival rates. At the end of the first growing season, plants in the reduced herbivory treatment had rosettes with area 17% larger than plants in the ambient herbivory treatment (F1, 332.7 = 5.1, P = 0.025, Fig. 1a, Fig. S1a). Despite their greater area, they had comparable numbers of leaves (F1, 333.7 = 0.31, P = 0.57, Fig. 1b, Fig. S1b) and biomass (F1, 62 = 0.25, P = 0.62, Fig. 1c, Fig. S1c). 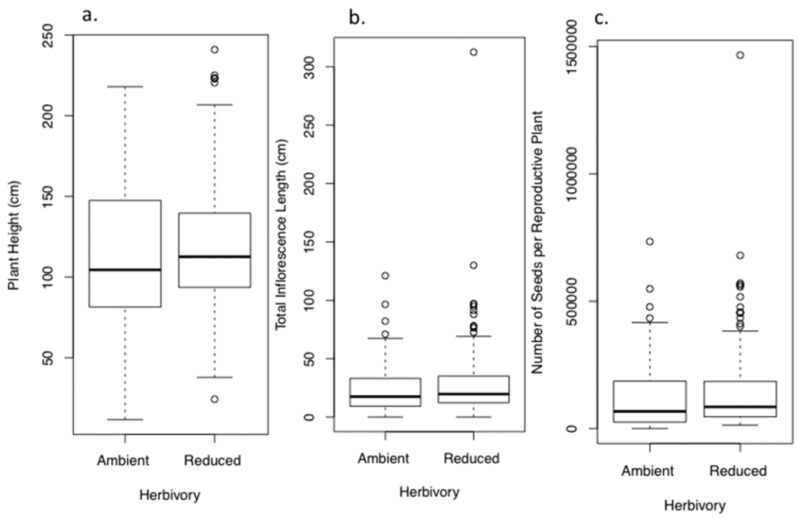 In both the reduced and ambient herbivory treatment, herbivores chose larger plants, generating a positive relationship between herbivory and rosette area across treatments (F1, 333.7 = 4.6, P = 0.03). Final rosette area (F1, 336.9 = 14.3, P = 0.0002), number of leaves (F1, 336.9 = 30.2, P < 0.0001), and biomass (F1, 61.2 = 4.43, P = 0.04) were all positively related to initial area, but were not influenced by cover of other plants (final area F1, 336 = 2.60, P = 0.11; number of leaves per plant F1, 330.7= 1.7, P = 0.19; biomass F1, 63 = 0.03, P = 0.86). Effect of ambient and reduced herbivory on size of rosettes of Verbascum thapsus at the end of one field season of treatment (the plants’ first growing season). Panels show A final rosette area B number of leaves and C biomass. Values are model means (backtransformed as appropriate) ± 1.96SE. A single asterisk indicates a significant treatment difference at P< 0.05; ns = not significant. See Tables S1a–c for details, and Figure S1a for a box-and-whisker plot provided for data visualization. Experimentally reducing herbivory increased performance relative to the ambient herbivory controls in the bolting plants. This was true for plants treated for only their second growing season (2009 bolting plants, see supplementary Tables S2a, b) and for those treated for both growing seasons (2010, Tables S3a–d). Specifically, reducing herbivory in only the second growing season (plants that bolted in 2009) increased plant height 8.8% (14 cm, Fig. 2a) and total inflorescence length 12.8% (6.5 cm, Fig. 2b), though the latter difference was only marginally significant. For the plants treated in only their second season, initial rosette area (measured as an overwintered rosette in spring 2009) was associated with taller plants and longer inflorescences (Tables S2a, b) and percentage cover of other plants was associated with shorter plants but this did not change inflorescence length (Tables S2a, b). Greater plant height and inflorescence length was associated with higher average herbivory levels (Tables S2a, b), a pattern discussed further below. 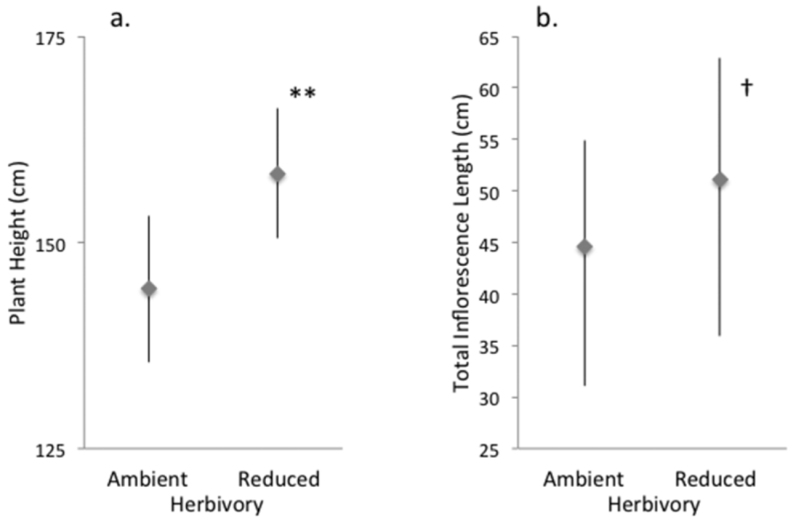 For plant height, there was a significant interaction between average herbivory and treatment, such that insect herbivores fed more on larger plants experiencing the ambient herbivory treatment than on smaller ones, but no such pattern was found for plants under reduced herbivory. Effect of ambient and reduced herbivory on characteristics of bolting plants after one field season of treatment (the plants’ second growing season). Panels show A plant height and B inflorescence length. Values are model means (backtransformed as appropriate) ± 1.96SE. Two asterisks indicate a significant treatment difference at P < 0.005; † indicates P < 0.10. See Tables S2a, b for details, and Figure S1b for a box-and-whisker plot provided for data visualization. Reducing herbivory over two growing seasons increased plant height by 15.6% (19.1 cm, F1, 235.3 = 10.99, P = 0.001, Fig. 3a), and increased total inflorescence length by 37.8% (8.1 cm, F1, 236.5 = 15.7, P < 0.0001, Fig. 3b). Reducing herbivory also increased the density of seed capsules (number per cm of inflorescence from 7.3 to 8.7, F1, 207 = 9.1, P = 0.003). Thus, combining the effects on inflorescence length and capsule density, the total number of seeds per plant was increased a substantial 49% from about 48, 000 seeds per plant under ambient herbivory to about 98, 000 per plant under reduced herbivory (F1, 203.2 = 22.6, P < 0.0001, Fig. 3c). The number of seeds per seed capsule remained comparable between treatments (grand mean of 451, F1, 37.8 = 1.6, P = 0.21). For most performance traits, cover of other plants had modest effects while initial rosette area (in spring of 2009) had substantial effects (Tables S2 and S3). Additionally, there was a significant interaction between average herbivore damage and treatment for most responses due to a positive relationship between herbivory and plant performance for ambient herbivory (water control) plants and no relationship between herbivory and plant performance for reduced herbivory plants (Tables S2 and S3). Effect of ambient and reduced herbivory on performance after two field seasons of treatment. Panels show A plant height B inflorescence length, and C seed production of those plants that reproduced. Values are model means (backtransformed as appropriate) ± 1.96SE. Three asterisks indicate a significant treatment difference at P < 0.0001. See Tables S3a–d for details, and Figure S1c for a box-and-whisker plot provided for data visualization. To elucidate the role that native herbivores and plant competitors serve in resisting invasion, it is necessary to expand current work in invasion biology to include species that are not particularly dominant in their new range. Our work adds to the sparse experimental information available for non-native plants in the middle of the spectrum between benign and strongly detrimental. It also lends insight into the importance of herbivory in shaping various aspects of performance, including lifetime fitness, of plants belonging to this under-studied group. Our data reveal that herbivory can reduce the performance of mullein at several stages during its life cycle. This evidence for biotic resistance by herbivores present in the recipient community contrasts with the fact that, at a biogeographic scale, mullein in the introduced range incurs significantly less chewing damage than mullein in its native range, and is attacked by fewer types of specialists (Alba and Hufbauer 2012). The duality of these patterns illustrates that while reductions in enemy pressure often manifest at the biogeographic scale, it cannot be assumed that enemy release translates into a fitness advantage over co-occurring native plants in the introduced range (Colautti et al. 2004). Indeed, our data indicate that over the course of mullein’s long residence time in North America (approaching 400 years), resident chewing herbivores have successfully incorporated it as a food source, as is the case for other introduced species (e.g., Junonia coenia, Euphydryas editha and Euphydryas phaeton feeding on introduced Plantago lanceolata in North America; Bowers 1991; Bowers et al. 1992; Singer et al. 1993). Most of the feeding damage we observed was caused by generalist grasshoppers, while across the native European range comparatively few grasshoppers have been observed to feed on mullein (Alba and Hufbauer 2012). It should be noted that, due to the hailstorms mentioned above, our study was conducted at a single location, and thus further investigation is needed to evaluate the degree to which this finding holds across mullein’s introduced range. However, the identity of the herbivores present at the site, as well as the damage levels we observed, are representative of populations sampled across a broad portion of the introduced range (Alba et al. 2013; Alba and Hufbauer 2012). Below we discuss the biological relevance of herbivore-induced reductions in performance at different developmental stages. Because mullein is semelparous and cannot spread vegetatively, the most effective form of biotic resistance would prohibit survival to reproduction. This was observed for common mullein, with plants experiencing less herbivory having a 7% higher chance of survival overall. Further, this difference in survival was detected even though reduced herbivory plants were attacked, albeit at a lower level. Increased performance associated with reduced herbivory was apparent even in a single growing season. First-year rosettes experiencing reduced herbivory had larger area than those exposed to herbivory. Larger overwintering rosettes in turn produced taller plants in the next season and eventually produced more seed per plant. This finding illustrates that even a partial release from herbivore pressure during the rosette stage can have a significant impact on plant fitness. The importance of rosette size in determining the reproductive output of mullein has also been illustrated in introduced populations growing in the eastern U.S. Gross (1980) reported that first-year rosettes had to be at least 6 cm in diameter in order to successfully overwinter and reproduce. Additionally, the probability that a given mullein plant would die decreased, while the probability that it would flower increased, with increasing rosette size (Gross 1981). In the mesic environment where Gross (1980) worked, she found that interspecific competition from co-occurring natives imposed strong biotic resistance against mullein in the old-field habitat where these studies occurred. In contrast, we found that surrounding vegetation was not associated with the performance of mullein rosettes (when crowding by competitors could critically affect light availability), and only weakly associated with some performance metrics in bolting plants. These results suggest that herbivory imposes stronger resistance than competition in at least some habitats, although competitive interactions have traditionally been invoked as the major source of biotic resistance both generally (Levine et al. 2004) and for mullein (Gross 1980, Reinartz 1984). A shortcoming of this work is that we did not evaluate the effects of pathogens. While we did not observe any leaf pathogens, it is nonetheless possible that pathogens contribute to biotic resistance. Reducing herbivory on bolting plants during only the second growing season (2009) significantly increased plant height (Figure 3). This increase in plant height has the potential to mediate ecological interactions with pollinators in the introduced range, which can in turn alter seed set. The flowers of tall mullein plants are more apt to be pollinated than flowers of short plants (Lortie and Aarssen 1999) and thus have higher levels of pollen deposition and rates of outcrossing (Carromero and Hamrick 2005). This has direct implications for plant performance because fruits that develop from cross-pollinated flowers produce more seed than fruits that develop from self-pollinated flowers (Donnelly et al. 1998). Thus, the reduced plant height that results from herbivory could decrease plant fitness through indirect interactions with mutualists. From an evolutionary perspective, reduced rates of outcrossing resulting from herbivory have the potential to reduce genetic diversity present in mullein populations. Reducing herbivory for two growing seasons revealed that insect herbivory inhibits growth of mullein by reducing plant height, inflorescence length, and seed capsule density, which together lowers the number of seeds produced per plant, i.e., fitness. In our analyses, we separated survival from seed production of surviving plants. However, if we consider those that did not survive produce zero seeds by definition, then the reductions in seed set would be even larger. This large reduction, however, begs the question of whether or not common mullein populations are seed limited or site limited (Maron and Crone 2006). It has often been assumed that plants such as mullein, which produce a long-lived seed bank, are buffered against herbivore-induced reductions in seed set (Crawley 2000; Louda and Potvin 1995). However, additive losses in seeds entering the soil over time could diminish the number of propagules available for recruitment. For example, modeling carried out by Maron and Gardner (2000) illustrated that reducing the seed set of plants with long-lived seeds has the potential to lower population size in the future, a finding that was subsequently supported in experimental systems (e.g., Maron and Simms 2001). However, a reduction in seed set caused by insect herbivores may not limit the number of propagules enough – seed set must be reduced beyond the population restrictions caused by microsite limitation, for example as imposed by density-dependent seedling mortality (e.g., Garren and Strauss 2009). While we did not address density-dependent seedling mortality during our field experiment, we observed seedlings germinating in dense mats surrounding parental plants, suggesting it could be quite important to regulation of population size. We have shown that reducing herbivory on introduced mullein directly affects several plant performance metrics. Additionally, we have uncovered an interesting pattern that provides support for the plant vigor hypothesis, which states that herbivores prefer to feed on more vigorous or apparent plants (Price 1991; reviewed in Cornelissen et al. 2008). As expected, herbivory was lower on average among plants in the insecticide treatment, and herbivory was equally distributed across tall and short plants. In the ambient herbivory treatment, however, there was a positive relationship between damage level and several measures of plant performance. This positive correlation suggests that when plants are unmanipulated, herbivore feeding preferences track plant performance, as suggested by the plant vigor hypothesis, rather than driving it. The mechanisms that underlie the preference of herbivores for more vigorous plants are not well understood (Price 1991, Inbar et al. 2001, Cornelissen et al. 2008), but size-based variation in plant nutritional quality or levels of defense may be of importance (e.g, Inbar et al. 2001, Cornelissen et al. 2008). Regardless of the mechanism, treating plants with insecticide effectively altered the choice regime at our site in a manner that obscured the typical feeding preferences of chewing herbivores. While introduced mullein has spread throughout North America, our data suggest that top-down regulation may help prevent the species from becoming more ecologically harmful. Our data also illustrate that even when introduced species escape from enemies and exhibit increased performance at a biogeographic scale, herbivores present in the introduced community can still impose biotic resistance at several points during the life cycle. Subsequent work with mullein and other relatively “benign” introduced species should explore how different forms of biotic resistance (e.g., via herbivory and competition) interact to shape population growth rates. More generally, for research on biological invasions to advance, it is imperative that we study not just the factors that facilitate invasion of successful invaders, but also those that inhibit population growth of less successful invaders. This research was made possible with support from the Colorado Agricultural Experiment Station. We thank Larimer County for granting access to the research plot. Janet Hardin provided invaluable assistance with the experiment. RAH acknowledges the support of Fulbright France, and INRA CGBP. C. A. was partially funded by long-term research development project no. RVO 67985939 (from the Academy of Sciences of the Czech Republic) during the writing of this manuscript. This work benefitted from discussions at meetings of the Global Invasions Network, supported by supported by the US National Science Foundation research coordination program under grant no. 0541673. Bowers MD (1991) The iridoid glycosides. In: Rosenthal G, Berenbaum M (Eds) Herbivores, their interactions with plant secondary metabolites. Academic Press, New York. Elton CS (1958) The ecology of invasions by animals and plants. The University of Chicago Press, Chicago. Lockwood JL, Hoopes MF, Marchetti MP (2007) Invasion ecology. Blackwell Publishing, Oxford. Lortie CJ, Aarssen LW (1999) The advantage of being tall: higher flowers receive more pollen in Verbascum thapsus L. (Scrophulariaceae). Ecoscience 6: 68-71. Salisbury EJ (1942) The Reproductive Capacity of Plants. Bell, London. We evaluated the effect of Bayer Advanced Dual Action Rose & Flower Insect Killer (ready-to-use) on Verbascum thapsus plant growth. Seeds were collected from the field site in Loveland, Colorado in 2008. After one month at room temperature, they were moved to 4 degrees C for two weeks and subsequently kept in the refrigerator until ready for use. The seedlings were germinated in plugs of germination soil mix that had been treated with fungicide on July 1, 2009. After one month, on July 31, plugs were transferred to 4.5 × 4.5 cm pots of fritted clay (Turface). Eight plants from each of 10 parent plants were grown for a total of 80 plants. The day that plants were transferred, they received a fertilizer treatment of 15-30-15 NPK. The plants were kept in the greenhouse for one week after transplant, after which they were moved to an outdoor shade house. They were watered, weeded and fertilized as needed. One week before the first treatment, all plants were treated with a 1% concentrated soap spray to remove any insects that might be on the plants. The plants were randomly assigned one of two treatments: insecticide or water. They were sprayed until wet but not dripping in a spray chamber and then moved to a greenhouse bench. The plants received a second treatment two weeks later. Two days before the second treatment, all plants again were treated with a 1% concentrated soap spray to remove any insects that might be on the plants. The plants were harvested two weeks after the second treatment and dried for one week at 40 degrees C to constant weight in paper bags, and then were weighed. The effect of treatment on biomass was analyzed in JMP. The insecticide neither increased nor decreased plant biomass (F1, 66 = 0.20, P = 0.66). Box - and - whisker plots illustrating aspects of rosette size of Verbascum thapsus at the end of one field season of treatment (the plants’ first growing season), corresponding to Figure 1. Panels show A final rosette area B number of leaves and C biomass. Box - and - whisker plots showing the characteristics of bolting plants after one field season of treatment (the plants’ second growing season), corresponding to Figure 2. Panels show A plant height and B inflorescence length. Box - and - whisker plots showing performance after two field seasons of treatment, corresponding to Figure 3. Panels show A plant height B inflorescence length, and C seed production of those plants that reproduced. Supplemental Anova Tables. Source indicates the different factors in the analysis. DDF is denominator degrees of freedom, NDF is numerator degrees of freedom, F values and P values are also provided. See text for additional details. Rosette area, 2009 (treated 1 season). Number of leaves, 2009 (treated 1 season). Biomass of rosettes, 2009 (treated 1 season). Plant Height, Bolting plants 2009 (treated only their 2nd growing season). Total Inflorescence Length, Bolting plants 2009 (treated only their 2nd growing season). Plant Height, Bolting plants 2010 (treated both growing seasons). Total Inflorescence Length, Bolting plants 2010 (treated both growing seasons). Seed capsule density, Bolting plants 2010 (treated both growing seasons). Total No. of Seed Capsules, Bolting plants 2010 (treated both growing seasons).